As part of her Rights of Non-Human Animal class, Professor Diane Michelfelder brought her class to the Airport Dog Park. Katie Westling, owner of Paw Pet Company, talked to the students about the dog park. This is the topic of Professor Martin Gunderson most recent essay which was just published in the Journal of Cognition and Neuroethics. One of our majors, Luke, performed a song about Janet Folina’s Advanced Logic course at our picnic last Fall. Another major, Daniel, performed a rap which you can see on Youtube by clicking here. Various philosophy students competed at the 24th Annual National Mock Trial Invitational Tournament at Loras College, including (but not limited to), Nathan Scheiner, Emily Wade, Jake Hasson, Sam “Henry” Eklund, and Lexii Carrillo. With nearly identical records, two Macalester teams finished in 5th and 6th place out of almost 70 participating teams. 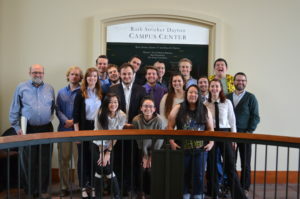 Macalester Mock trial is looking forward to the regional competition at the University of Wisconsin – Superior in two weeks, and we are hopeful that we will advance two teams in the national competition! The kids I taught are a smart and energetic bunch. I’ll never forget the delighted looks on the students’ faces when philosophical arguments were brought to life through silly but thoughtful philosophical dialogues. Despite being between the ages of 8 and 10, they showed maturity during class discussions about topics such as politics and gender inequality and its effect on friendship, politics, and perceptions of superheroes. Ultimately, the students taught me that kids are natural philosophers: always curious with questions and willing to debate when given the opportunity. Moreover, philosophy provides a platform for kids to develop intellectual humility, empathy, and courage through conversation and creative thought experiments. I hope that philosophy associations and educational institutions will be more proactive in finding ways to give children a taste of the intellectual pursuit we, as collegiate and professional philosophers, have been so lucky to experience.